This roof is the largest stadium cover in the world shading over 60,000 seats and covering a plan area of 47,000 sq. m. The 24 columns are arranged on a circle with a 247 m diameter, large enough to fit the Astrodome inside. The huge umbrella keeps the sun off the seats and concourse slabs, providing shade and comfort in the hot desert climate. The structure is made of 24 equal units. 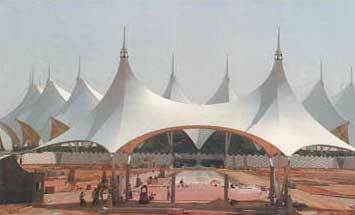 The entire roof has only two roof panel shapes which generate the rich sculpture of the roof umbrella. Owner: Ministry of Health and Youth Welfare, Saudi Arabia. Architects: Ian fraser, John Roberts & Partners, London. Roof Design and Engineering: Geiger Berger Assoc. P.C. ; Horst Berger , Principal-in-charge of design.